Chaitra navratri starting from 8th April, 2016 and it is one of the most auspicious celebration of Mata ji. In shaktam it is mentioned that if someone wants moksham and mukti than he/she can get through devoting MAA in navratri. If you believe in Hindu mythology, it is mentioned that there are 6 seasons or ritu and each of this ritu (seasons) are actually form of female(s). And thus each of this ritu has their own importance. Each of this ritu are endowed with a specific navratri season. And as per hindu shashtra, 4 out of 6 of these ritu have more importance and amongst these 4 only 2 are mostly followed form of navratri by hindu. So, if you devote MAA in theses chaitra navaratri then you are going to good return. 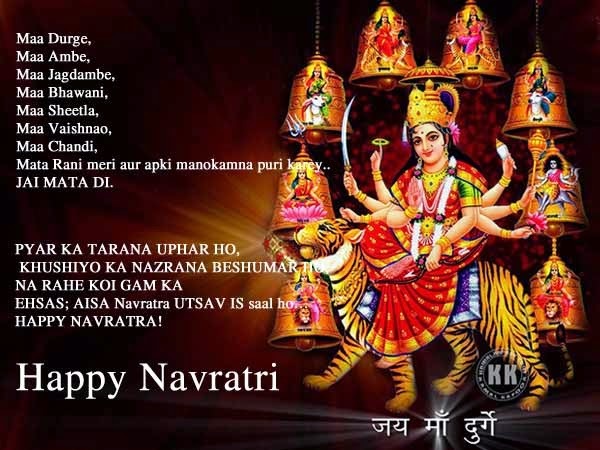 In chaitra navratri, people devotes nine different form of MAA on each of the nine days, which are Shri Shaill putri,Shri Bhramcharini, Shri Chandra Ghanta, Shri kushmanda, shri skandmata, Shri katyayani, Shri Kalratri, Shri mahagauri and Shri Shiddhidatri. On each day of chaitra navratri, you have to take bath, make you self clean and put the "Kalash". 1. You should have your bath on or before 9 AM of each day. 2. Try to eat only once in a day (satvic food). 3. Offer some home made bhog (special food items), and if this is not possible then offer milk and fruits to MAA. 4. you have to go to temple regularly and do puja for MAA daily in morning and evening, (you can do this at your home temple too) and lighting lamp (Diya) and offer flower and doing arti. 5. Try to gift 2 small girl child (as per your comfort) on each day of navratri (in evening). 6. Wear only new and fresh cloths each day, don't wear old discarded cloths. 7. Repeat shloks and mantra in favor of MAA few minutes daily. 8. Pray to MAA to clean your past bad karma's and pray for happy and bright future for you and your family. 1. Cutting Nails on days of chaitra navratri is not good thing. Try to avoid till ekadashi. 2. Avoid cutting hair cut on chaitra navratri, if possible. 3. Avoid stiching and knit during this period of time. 4. Don't use harsh word, bad words, lies on days of chaitra navratri. 5. Don't leave the jyot of diya burn it out, and after pooja of each day, with some flowers put to rest the Agni which stood as the witness to your puja and offering. 6. your home should be clean and dust free, at lest your pooja room where you are doing devotion for MAA and your home kitchen. 7. Avoid wearing slippers in the house in days of chaitra navratri if possible. At lest not in pooja room. 8. Avoid studying anything on the 9th day; and instead you should keep all your books and other modern gadget near the MAA and seek her blessing on this day and then on "Vijay Dashami" day you should take them and read sitting before MAA. These are some simple rules you need to follow in these 9 days, and hope MAA will bless all of you with good health and lots of happiness. if you read Durga Saptashati or Devi Mahatmiyam parayanam on each of these days, then it will bring excellent progress and prosperity with high success in your life.